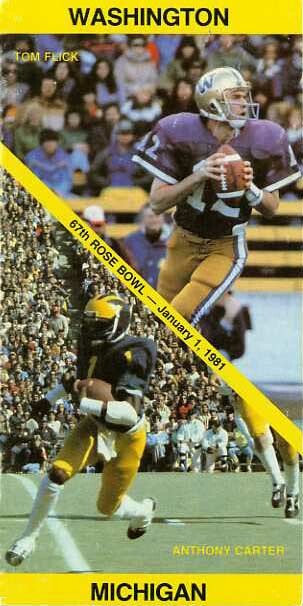 The Wolverines may have started slowly in 1980, but by October, nobody was able to stop them. Beginning with the Illinois game on October 25, Michigan put together a streak of 15 consecutive scoreless quarters, shutout Indiana, Wisconsin, and Purdue, won the Big Ten title outright for the first time since 1971, and took a string of 18 straight quarters without allowing a touchdown into the Rose Bowl to face the Washington Huskies. 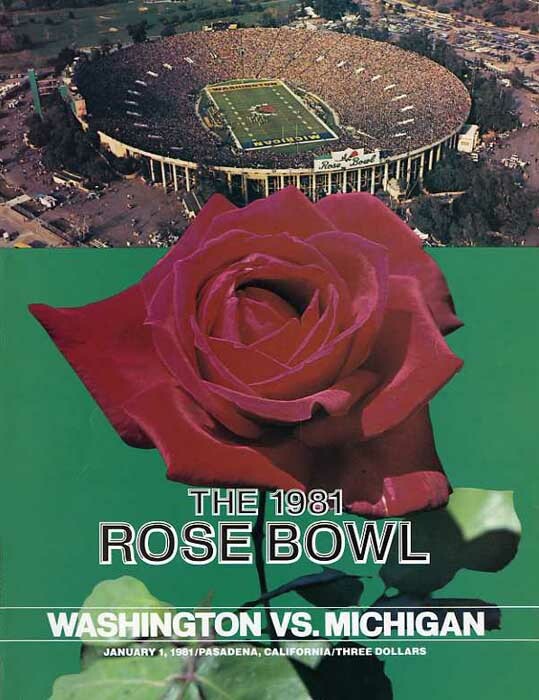 The Huskies compiled more total yards against the Michigan defense, 374, than any team had all season, but the Wolverines continued their consecutive no- touchdown string, and Bo Schembechler won his first Rose Bowl in six tries. Washington dominated the game early, and on its second drive, the Huskies reached the Michigan one-yard line. But the Wolverines then stonewalled tailback Toussiant Tyler on fourth down and took the momentum from Washington. Butch Woolfolk put Michigan in the lead with a six-yard td burst near the half, and despite Chuck Nelson's two field goals, the Wolverines remained in command the rest of the way. Ali Haji-Sheikh's 25-yard field goal capped a six- minute, 83-yard drive to open the second half, and John Wangler connected with Anthony Carter for a seven-yard score, widening the Michigan margin to 17-6 with three minutes remaining in the third quarter. From there, the Wolverine defense took over with Keith Bostic forcing an interception and limiting the Huskies to 23 yards in total offense until the game's final minutes. Michigan clinched the victory on Stan Edwards' one-yard td dive with four minutes remaining in the game to provide the final margin. Butch Woolfolk's 182 yards rushing earned him game MVP honors, while Don Bracken's 73-yard punt in the first quarter set a Rose Bowl record. The season which had looked so bleak after a 1-2 beginning thus concluded with nine straight 'M' wins.